Hi, my name is Shelby. 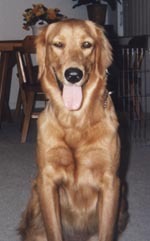 I am a female Golden Retriever born August 27, 1996. I live in Florida with my mommy, but I was born in the Midwest. I used to get into a lot of trouble when I was a puppy, but didn't we all! Click on the picture below to see my puppy pictures! When I turned a year old, my mommy decided to have a birthday party for me. She invited a lot of her friends and about 6 of mine. All of my friends were golden puppies too. Since we live in a 3 bedroom condo, you can imagine how crowded it was. We were all having loads of fun and getting very excited. You know what that means to puppies! What a mess! Mommy decided never to do that again, but boy did we have fun. Click on the picture below to see my party! Over the years, I've continued to make lots of new friends. We do many things together. We play at the park. We greet each other on our walks around the neighborhood. We also visit each other at our homes. If you would like to meet some of them, click on the puppy below! Sometimes I have to go the doctor. You might not believe it, but I actually love going to my vet. His name is Dr. Munoz and he is now at the Banfield Animal Hospital. If you would like to find a Banfield Hospital in your area, click on the picture below. Mommy has a special friend named Cyndi. She takes in unwanted golden retrievers that are looking for a loving home. She feeds them, bathes them, takes them to the doctor, brings them to the park and most of all, loves them. While she is doing all of that, she tries to find them a loving, caring home. To learn more about golden retriever rescue, visit Cyndi at her rescue website. I am so glad you visited my website. If you have any questions or comments, feel free to email mommy and me! We will love hearing from you. Click on the picture below! Don't forget, please bookmark this page! Copyright © by P. Fishman, 2000 Photographs may not be removed without permission.